This casserole-like method of preparing nachos is so easy to do and so delicious. Top it with a jalapeno sour cream mixture for a terrific blend of Southwestern flavors. 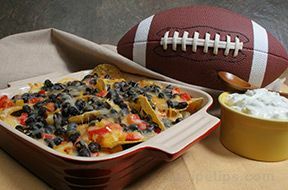 This dip recipe is perfect for football parties or any special celebration with friends and family. In mixing bowl, combine chicken and lime juice, salt and pepper to taste. In skillet, heat 1 1/2 tablespoons oil over medium-high heat until hot. Saute bell peppers until crisp-tender; approximately 3 minutes; transfer to a bowl. 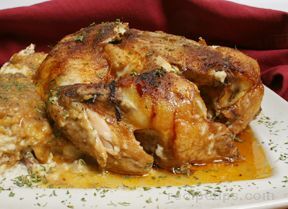 Heat 1/2 tablespoons oil in the skillet and cook garlic, cumin, and oregano; stir approximately 1 minute. Sir in beans and cook until heated through; season with salt and pepper. Layer tortilla chips on the bottom of the baking dish, then sauteed peppers, beans, chicken, and cheese; all in that order. Repeat, starting with a layer of tortilla chips. Place in the oven and bake until cheese is melted. While the nachos are baking, mix the sour cream and pickled jalapenos in a small dish. Serve as a sauce for the nachos. Add more jalapenos to reach desired heat.